It’s never too early to start thinking about how you want to spend the holiday season. During this time of year, Philadelphia is alight with all the excitement and charm of a big city, complete with decorative lights and fun public events. The Rittenhouse offers an ideal location near the best city events as well as an ample selection of specials and packages designed to make our luxury hotel feel like home during the holidays. This year, take the stress out of planning Thanksgiving. Guests and locals alike can focus on family while enjoying our delicious all-day brunch at Lacroix for just $105 per person. For reservations, please call 215-790-2533. Go no further than The Rittenhouse Spa & Club – Hair by Paul Labrecque for luxury holiday gift shopping. From November 10th – December 31st, we are offering a complimentary 30-minute neck and shoulder massage with a gift card purchase of $200 or more, along with 20% off Natura Bisse and ESPA products and a free gift with the purchase of two or more items. Massage must be redeemed by December 31st, 2017. This holiday season, bring your little ones to the beautiful Mary Cassatt Tea Room for our limited time Teddy Bear Tea. Complete with delicious teas and treats ideal for children and their teddy bears, this offer is sure to be the highlight of your stay in Philadelphia. Call 215-790-2533 to reserve today for just $60 per person. Dates include December 16th, 22nd, 23rd, 28th, 29th, 30th. Spread the holiday joy from November 24th-December 31st by bringing an unopened, unwrapped toy to the front desk at The Rittenhouse during our Ronald McDonald House Toy Drive. Spend an afternoon with award-winning boutique Egan Rittenhouse during their Autumnal Wreath Making Workshop on Sunday, December 10th. Learn the art of wreath making with blooms inspired by the beauty of the season. Top off the class with an Herbal Hot Toddy by Terra Luna. To reserve your space, please call 215.433.1632. Space is limited to 12 guests. From November 24 – December 31, The Rittenhouse will host a variety of complimentary offerings available for guests. Hot chocolate will be available in the lobby daily and roasted chestnuts, a holiday favorite, are available daily upon request. Guests who book their stay around Thanksgiving can participate in or play spectator to the Philadelphia Marathon, taking place on November 19. This local tradition is the perfect way to kick off the holiday season in Philadelphia. 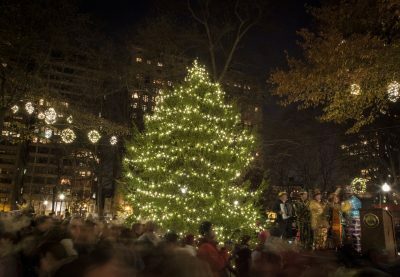 There is nothing that puts us in the holiday spirit more than the traditional tree lighting ceremony held in Rittenhouse Square each year. This event takes place on November 28 and features a variety of entertainment and fun for the whole family. Most notably, those who attend the festival will get to witness Santa Claus flip the switch to illuminate the 30-foot-tall tree with over 5,000 lights. To help you stay warm, we will be offering guests complimentary hot cider and hot chocolate. Don’t miss out on Philadelphia’s most magical season. Book your holiday getaway at The Rittenhouse Hotel today.